Happy CNY~! - A mummy's inane blabberings.. 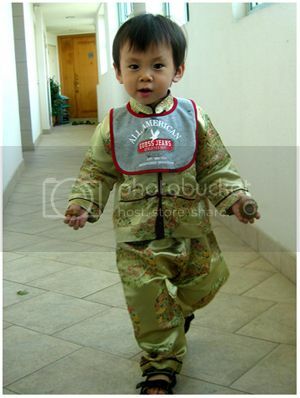 This year, Aidan had sooooo many chinese costumes to wear. Hubby bought 2 from Vietnam when he was there for business, my mom got 2 more from Shanghai when she was there for a holiday and my sis-in-law Jen got him another suit when she was in China for a biz trip too.. 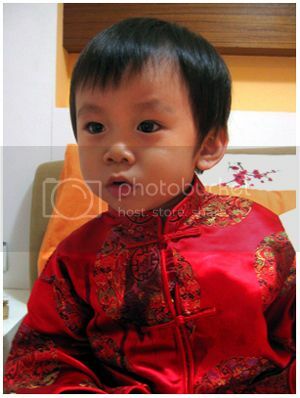 Looking kinda stoned coz we'd just dropped him off in school..
Day 2 of CNY in red! The li' boy was so darn cute! 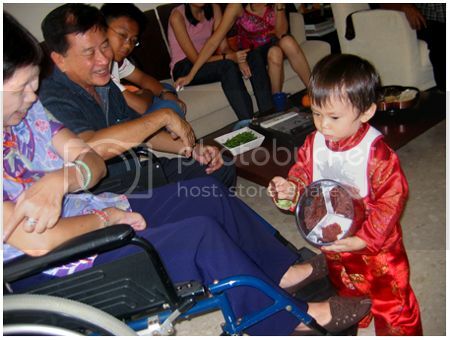 When we had guests in the house, he was so friendly & hospitable! We didn't taught or instructed him to but he automatically took the tidbit/goody boxes and started offering it to every single person. 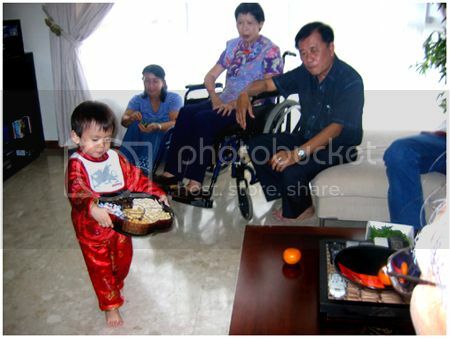 My uncles and aunties were so amused by the li' one 'coz he was so diligent and earnest! Have a prosperous Chinese New Year to one and all!!!! he always has this stunned, mouth-open look that i cannot imagine what he'd look like as a grown up. 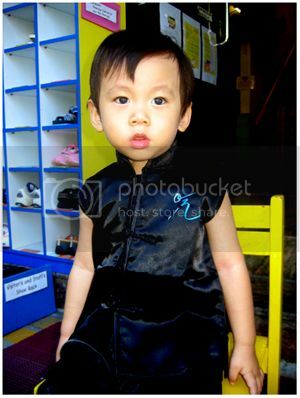 yeah lor..bugger doesnt pose for camera like most kids. Actually, most of the time, i have to take pics of him unaware coz when he discovers the camera, he'll lunge for it and grab it from me. He's really into 'taking pics' now..
heh now that u mentioned it, it is more 'jay-chou-rish'!!! 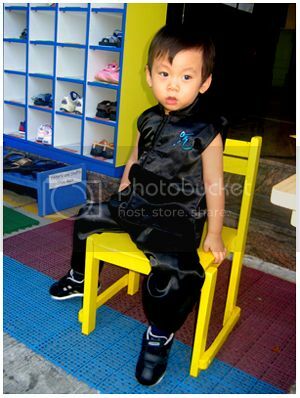 Love the black outfit against the yellow chair! Aidan the Kunfu Master! :)) Happy Lunar New Year! Hope u got lots to crow about for the year ahead! i like aidan in gold! hotty! haha! happy rooster year to you and family! Happy New to u too!! So when can I come over to visit? Heh. Gong Xi Fa Cai!! wishing you & family a healthy, happy & prosperous Rooster Year!!! Aidan looked so cool in the suit!! nice! erm.. i meant to say the black suit!! 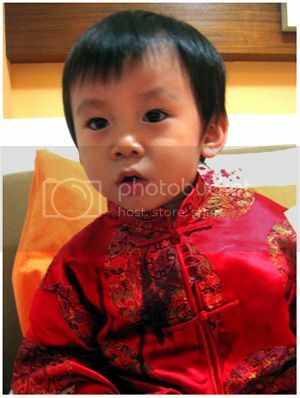 heh..aidan probably thought it was fun to offer the food ard..even though he loves to eat, he also loves to see pple eat too :D..
i find the red too red *grin*..
U did get Megan to wear a cny costume didnt u? :) how come she doesnt like the one u got for her? wow, aiden sure has grown up! hi. i have been reading a couple of your entries through ickleoriental. not sure if i have the pleasure to add you on my friends list. your son is really adorable... and with loads of "grownups-melting" expressions. He is looking good.. can't wait to see him next month. ur flight confirmed yet? i already told hubby i v tempted to visit hk again leh.. I love him in the black outfit - so jay chou-ish and of course, the red one cant go wrong.